If you ask most rock fans in the UK to list all the Greek rock bands they know, the chances are that in almost all cases, the list will contain just one band - Firewind. Well there are other rock bands from Greece worth checking out, and Outloud are one of them. Formed in 2004, the band released their debut album (We'll rock you to hell and back again) in 2008. 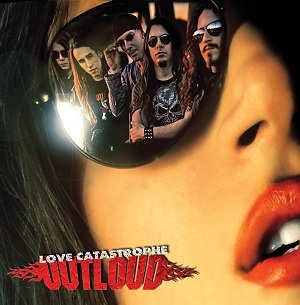 "Love Catastrophe" is their second album and is produced by Tommy Hansen (who has worked with bands including TNT and Helloween), and Bob Katsionis. Some of you may recognise the name of Bob Katsionis - as well as being a member of Outloud (playing Keyboards and guitar), he is also a member of Firewind. "We came to rock" starts with a sound familiar to older listeners - the crackle of a stylus settling on a vinyl album, before a sleazy sounding voice intro. Then the music kicks in. I must admit that with the intro and the opening guitar work I'd expected a more sleazy sound but what you have here is good melodic rock music in the vein of TNT but a bit heavier. As you'd expect from a melodic rock album there are plenty of songs about love - in fact only "We came to rock", "Live again" and "Clean hands" manage to avoid being songs about love. Perhaps a slightly more diverse range of subjects to sing about might be in order for the next album? Usurprisingly the heavier more powerful songs are the ones that arent all about love - "we came to rock" and "Live again" in particular. Despite the album being melodic rock with lots of songs about love, its not lightweight - there is still plenty of power throughout the album with good guitar work and pounding drums. I get the feeling that with a different singer with a deeper voice the band could sound very different and become much more of a heavy rock band than melodic rock - its the vocals of Chandler Mogel that for me anchor the band in melodic rock territory. With Gus splitting his time between Firewind and Ozzy Osbourne then hopefully this will mean Bob Katsionis can take Outloud on the road and play some dates around Europe - this band is one that is too good to be limited to a few dates in Greece. "Love Catastrophe" will be released on 25th July 2011 through AOR Heaven records.